As I stand here in the warm sunlight on a sunny day in May, I look out across Maghery Bay to Coney Island. 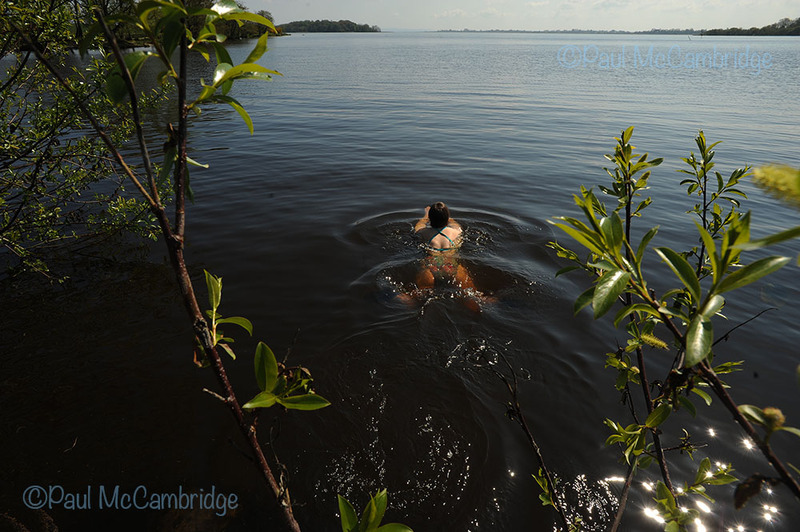 The sun glints on the waters’ surface as I slide in and catch my breath as the cold water folds around me, the warm sun belying the fact that the water has not yet warmed this early in May and I take a moment to acclimatize to the chill. The soft peaty water of the lough takes me back to swimming as a child a little further along the shore, at my grand-parents farm in Co Tyrone. I am reminded of the adventures my brothers and I had, swimming, canoeing and camping out on our own small island, taking over the hide used for duck shooting in season, and imagining ourselves far away from the civilized world. To the right of the slipway, two markers approximately 150 metres out warn boats of the shallow water, beyond these markers it quickly gets very deep. The bay is sheltered out to Coney Island which sits 1 kilometre away as the crow flies and makes a pleasant swim for the strong and confident swimmer, however the far side of the island is exposed to the greater lough and is subject to the eddies and currents lough Neagh is renowned for. Here at Maghery Country and Caravan Park – at which there are no longer any caravans and only the occasional wild camper – a slipway flanked by wooden boardwalks gives easy access. A noticeboard maps the Blackwater canoe trail and the canal leading to the Blackwater river is to the right of the slipway. A little further down the laneway one may take the footbridge across the Blackwater and step into County Tyrone. Living year round on the Island, Peter the caretaker, has a wealth of knowledge of the rich history, flora and fauna. Peter gives guided tours by prior arrangement through Kinnego Marina. Take a dry-bag with warm clothes and sandals for a great day out, swim to the island then take a walk around the paths leading you to the Anglo/Norman motte from 13C, the 16C O’Neills Tower and the stone at which St Patrick rested during his travels. Just leave yourself good time to swim back again. Be aware that at times jet skiers use this jetty too and make yourself clearly visible.